So I’m officially obsessed with making tortillas now. I love homemade tortillas. They are so much better than the ones you buy at the grocery store! And so incredibly easy to make! I will admit that the rolling and cooking process does take a few minutes, but it really doesn’t take all that long. I made a double recipe of these, so 24 tortillas, and it still only took about a half hour to roll and cook them all. I get two skillets going so I can toss them in as quick as I can roll them and the process isn’t too bad. Longer than grabbing a package off the shelf when you’re shopping, it’s true, but oh so much better tasting! And it’s just plain satisfying to churn out a batch of homemade tortillas! Try it, you’ll feel like a pro-star. (Did that term just conjure up memories of Pro-Star cereal for anyone else? With Gretzky on the box? No? Just me?!) And yes, I just totally dated myself, but that’s okay. Anyhow, tortillas. Homemade roasted red pepper tortillas! With roasted garlic too – cause why not. I was roasting red peppers anyways so I threw some garlic in the oven with it to add to the tortillas. Adding garlic is never a bad idea in my opinion, especially roasted garlic. 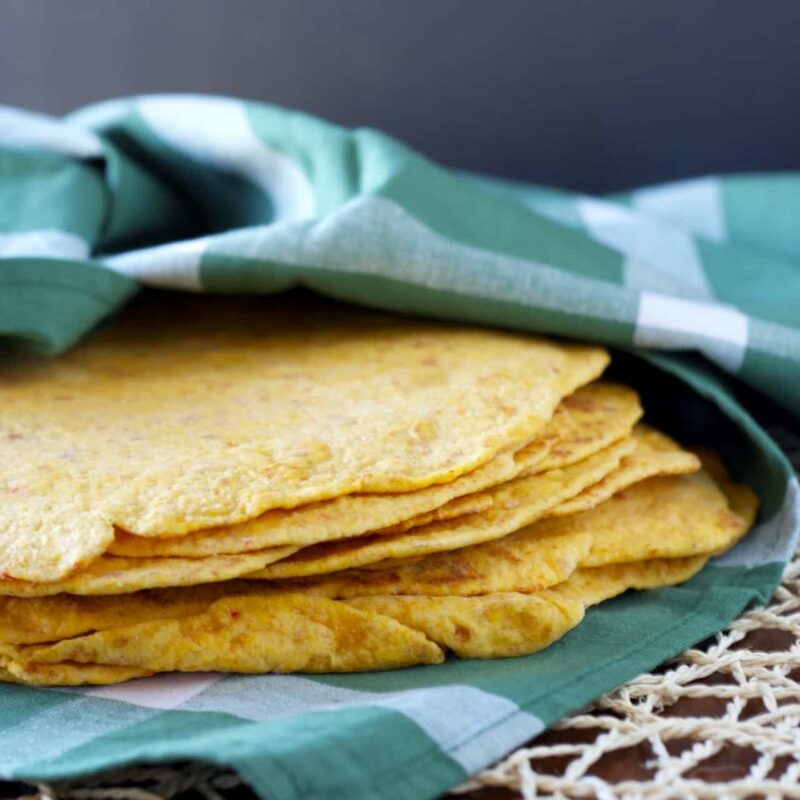 These tortillas are super quick and easy to mix up, it’s all done in the food processor, which you really can’t beat for speed. 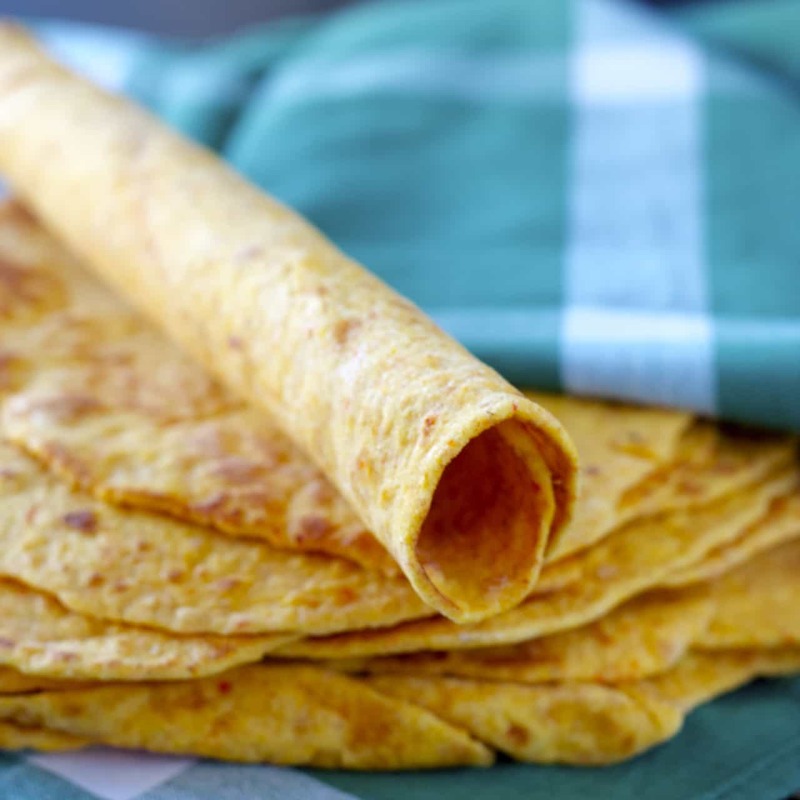 This recipe is very similar to my spinach tortilla recipe, except that you don’t need to add any water to the dough, as the red pepper puree adds enough moisture to the dough as is. Other than that it’s pretty much the same. So easy, just toss a couple red peppers and garlic cloves in the oven for 25 minutes, toss everything in the food processor to combine it, let the dough rest for 10 minutes, then roll and cook. Easy. I bought a package of tortillas a couple of weeks ago. What can I say – it was a busy week, I was tired, grabbing the package IS easier. So disappointing. Especially after making my own for the last year or so. They stick together so much, it’s absolutely maddening trying to peel the things apart as they shred instead of coming apart. Why do they do that? Maybe it’s the brand I buy? I’ve tried a few. I don’t know. But these homemade roasted red pepper tortillas (and these whole wheat and spinach ones!) are amazing. I don’t think I’ll be buying them again. You know, until the next week I’m feeling tired and lazy. But right now, I don’t think I’ll be buying them again! These are just too good. And too easy. And I like feeling like a pro-star in the kitchen. Note: You could definitely make these fully whole wheat, or fully all-purpose flour, I did 1/3 whole wheat for the ones in the pictures. Also, you can use coconut oil, lard, shortening, or butter - I’ve been liking coconut oil lately, but I change it up depending on my mood. I think lard is the most traditional for tortillas, but I’ve used all of them and they all work well, so use whichever you prefer. Preheat the oven to 425 degrees F. Place whole red peppers and garlic cloves on a parchment lined baking sheet and roast for 20-25 minutes, turning occasionally, until tender and the skins have blackened. Let cool and then remove the skins and seeds from the red peppers, and the skins from the garlic cloves. It should peel off easily. Place the peeled red peppers and garlic into the bowl of a food processor and pulse until pureed. Add the flours, baking powder, salt and lard (or whichever substitute you’re using) and pulse until the mixture forms a ball. If your dough still looks dry and isn’t forming a ball, add some hot water 1 tablespoon at a time until it comes together. Alternatively if it is really wet and sticky add a little more flour, 1 tablespoon at a time. The dough should form a ball and be tacky but not wet and sticky. Remove the dough from the food processor and divide it into 12 equal pieces on a lightly floured countertop. Cover with a clean tea towel and allow to rest for 10-30 minutes. Heat a large skillet over medium heat. Roll out one dough ball at a time on a floured countertop until it is very thin. If the dough is springing back and not holding it’s shape, let it rest for another 5 minutes and try again. It should roll out easily. Make sure to move it around and flip it over while you roll it out to prevent sticking, flouring as needed. Cook it for 30-45 seconds per side, flipping it with a rubber spatula when bubbles form and are lightly browned. You may need to lower the heat if they’re cooking too quickly. 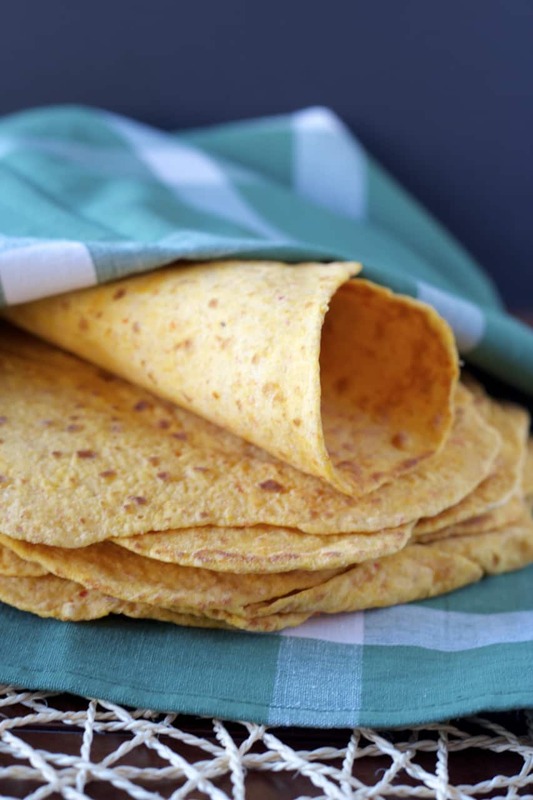 Stack the tortillas as you cook them and cover with a damp tea towel. Use immediately, or store them in an airtight plastic bag in the refrigerator once they cool. They can also be frozen. Heat briefly in the microwave before using to make them more pliable. Hi Stacey, I have seen some of your comments on other food blogs, and decided to check out your blog today. Homemade tortillas are the best and I appreciate the fact that you used lard in your recipe. Lard is so under-appreciated and it's nice to see that more people are starting to use it again. I've started using lard in some of my dessert recipes and it's delicious. Anyway, great looking recipe. Thanks so much Neeli! I think lard is the most traditional thing to use in tortillas, but I will admit I mix it up, and have used lard, butter or coconut oil depending on my mood. Thanks for stopping by! Yum! I've only made homemade tortillas a few times and I can't wait to try these roasted red pepper and garlic ones! Love how flavorful they look! Wow, great recipe! 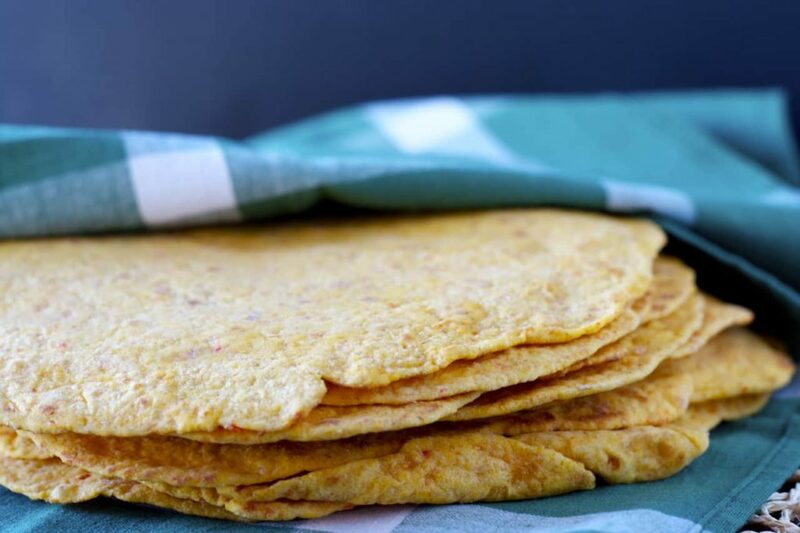 I love homemade tortillas, and the red pepper is even better! Yum! These look so flavorful :) We're having Mexican tonight and I wish I had some of these! Wow I've never tried making tortillas at home these look fantastic. Love that you added red peppers to them. I need to make these next time I make tacos!! You have no idea how excited I am to try these tortillas! Roasted red pepper and garlic is my weakness! And it's so true what you said: Once you start making homemade tortillas it's hard to go back the storebought stuff! Oh how I need to try making tortillas at home! I loved the looks of your spinach ones but now I don't know which ones I want to try first - these look awesome! Everyday?! Really? They're easy but I don't think I'll ever make them everyday! I'm all about making a big batch so I don't need to bother for a week or two! Thanks Manali! YG here thanking you for your submission and to let you know this is a great post! We eat our share of tortillas in this house and I've been looking for a good recipe to try, instead of buy, and this looks like the one! I've never made my own and I'm pretty sure you just talked me into it! So true, EVERYTHING is better with roasted garlic! Haha, glad I convinced you! Hope you like them! Thanks Senika! I've been wanting to try making tortillas for so long now, but have never gotten around to it. Life is super busy right now, but I think I need to make the time to try these soon! They sound so good with the roasted peppers! Pinned! Thanks so much Kristine, and thanks for pinning! I love making my own tortillas, but I have never thought to add flavours in to them like this. What a great idea! I actually started adding flavours in my quest to get veggies into my 3 year old! Now it's becoming a bit of an addiction - how many kinds can I make?! Thanks Dannii! I love this! I've never thought to make my own tortillas but you make it sound so easy. I am certainly going to try this soon! Seriously, so easy. I was surprised how easy it was the first time I made them! Thanks Jen! I love the idea of making your own tortillas, Stacey! I've never even thought to do that, so this is brilliant! I'm sure there are so many different flavor combinations. This red pepper kind sounds delicious and I love how easy this is, too! Thanks Gayle! They really are shockingly easy, and so good!